As the NBA season comes to a close we take a look back at the Finals, examining what could have been….and then giving respect where respect is due at what really was. He made it look too easy. That is the only explanation, the only excuse, I can come up with why I wouldn’t pass the torch earlier to Kevin Durant. That, coupled with Bron annually snatching up the MVP trophy in decisive fashion, paired with no Finals appearances, no titles, and my personal knack for patience and avoiding hyperbole before I proclaim anything the greatest. He is just so silky smooth. Everything he does, whether getting to the rim or pulling up for a 35 footer, all looks so effortless. The calmness in which he controls the game had me fooled, but with a thunderous (pun intended) Game 1 dunk1 in the NBA Finals, that sent shivers through the entire league as it may be awhile before anyone else gets to wear jewelry, Kevin Durant proclaimed what I should have known for some time. That he has arrived. That there is no one better at the game of basketball. Kevin Durant is a basketball player 70 years in the making. The perfect example of evolution in a game defined by it. A hybrid of sorts: Part Russell; Part West; Part Gervin; Part Magic; Part Bird; Part Bird; Part Dirk, with all their capabilities and a frame created if you did indeed use the DNA of each of the aforementioned superstars to create one perfect basketball being2. With the NBA Finals, the stage, Kevin Durant, the performer, was given the opportunity to show the entire world who he is, what all the hard work and the gifts attributed to him have allowed him to become. Game 1 was a coming out party if there ever was one, if that is even fair to say about a 3 time scoring champ with multiple big games and clutch shots under his belt. He made noise early (the dunk heard round the league) and was superb throughout the fourth quarter where legends are made, or, in some cases, fools anointed. He had 17 of his 36 in the waning quarter, doing it every which way but loose. He, along with his running mate Russel Westbrook3, outscored the Heat 41-40 in the second half by themselves. What was amazing was the subtlety, the calm before the fourth quarter explosion. It appears the Durant has the capacity to appear to casually dissolve from a game while never releasing his grip on it, scoring when the opportunity presents itself, from time to time, and then taking over when the time is right. It’s uncanny. If titles were given on how you start a series OKC would be have their hands full cleaning up a parade this weekend, but that is why we play them out. What could have been was not to be. Alas, it was not his time. It was bound to happen. Anyone thinking, hoping, otherwise was kidding themselves. Game 1 was what it was; another dominant home-court appearance for the Thunder and their rising star(s). It was a tremendous coming out party for a man and a team that we can assuredly say will be vying for a title year after year, and probably nabbing a couple. There were few, if any, who could see the outcome of this series in the Heat’s favor after what occurred in Oklahoma in Game 1. But what we didn’t see that evening was the fire that was lit inside the actual greatest player in the NBA right now. A man who finally matured to the point necessary to ascend the mountain….to be finally known as a World Champion. How quickly things change, in a series that is. In game 2 the Thunder, once again, acted as the first half matters little and this time it caught up with them. But it wasn’t their lack of effort in the games earliest chapters that made the difference, but the extreme undying effort and will of the best player on the opposing squad. I honestly haven’t seen Bron play harder, want it more. His sense of urgency in this game, and then the rest of the series, was absolute. He had a look I hadn’t seen before. His team shared his fire. Bosh went after rebounds with ferocity, tapping the ball out on continuous plays4, Wade put up 24, Battier was raining threes. But it still came down to one play; Thunder down 2 and the ball in Durant’s hands, guarded by Bron. Perfectly scripted. Many will speak of a foul, but the victor writes the history books and Durant could have made that shot. Bron bodied him up strong and fucked with his center of gravity perfectly. In game 3 the Heat were just the better team, all around, and they once again had the best player on the court. Bron had another great game (29/14) and that player who seemed so tentative down the stretch of games early in his career…well that player does not exist anymore5. Sorry league. 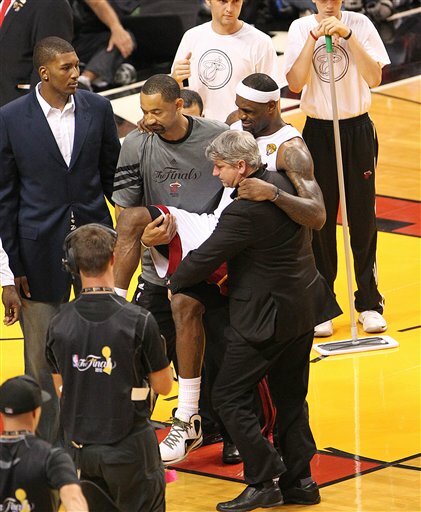 Lebron’s playoff history, it seems, is filled with more tales of blunder and defeat than of triumph6 but Game 4 of the 2012 should and will be remembered for Lebron James hitting 2 crucial shots on one leg7, the later a 3 pointer that brought the house down8 and gave them the lead for good. James dealt with cramps the whole second half, ones so intense they pulled him from the final moments of the game….but not before he handled his business. Chalmers went off. Westbrook dropped 43 and seemed on route to tie the series personally at times9 but Bron was clutch, yeah clutch, when it mattered most. He wanted the big shot. He took it, and made it….then had to sit out the final 56 seconds and let his teammates finish the job. On the first play of Game 5 it was clear that his time has arrived, and if need be he was going to see to it personally. A powerful dunk on the break and he, they, never looked back. 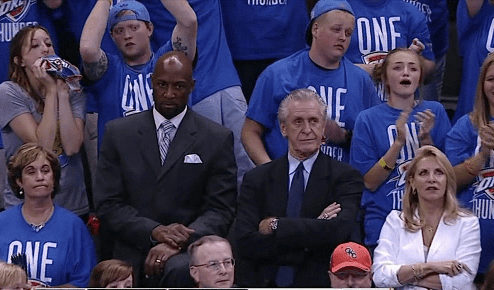 The Heat played the entire game with the sense of urgency that the Thunder should have. 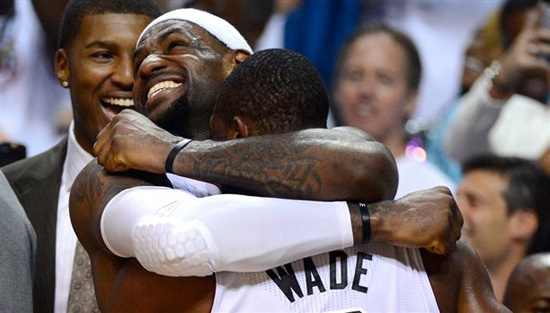 The Heat fans were given a gift rarely seen in sports. They were able to enjoy almost the entire second half knowing they were going to win the title. No fingernails….just joy. At the 4:49 mark Bron got his triple double. At 3:01 left in the fourth the Big Three left the game to celebrate what they had accomplished as Juwan Howard took a break from his apparent coaching duties to get some playoff burn. Today is not a day for hate10. Too much of that has been cast and if you’re still in the market for some more there will be time. Bron has many more rings to go before he catches up with the Michaels and Kobes of the world. No, today is a day to give respect where respect is due. 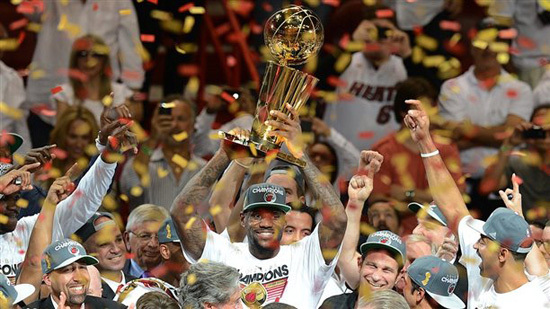 The most polarizing player of our time is now in possession of a Larry O’ Brien trophy. The trio that celebrated too early can now officially celebrate. The haters will continue to scoff at how they did it11, compiling a group of superstars seemingly being the easy way out. But there is nothing easy about winning a championship and it is clear that Bron has matured. He was seen this playoff run playing to his full potential. He played and then guarded every position on the court. He made his teammates better12 at every turn and for all this he was handed his first finals MVP trophy13. He has been fighting for this for years. We have seen him take teams of nobodys on playoff rides unimagined. We have seen him fail in clutch moments on the biggest of stages. We have seen him come o’ so close on multiple occasions. And now we have seen him get over the hump in unbelievable fashion having one of the most dominant playoffs EVER14. It felt like his destiny from the moment he graced the cover of Sports Illustrated in his St. Vincent–St. Mary High School uniform, yet things became awkward, and then even thrilling, as he couldn’t seem to get it done. It took 9 years for the best player in the game to get his title. Now it’s done and the man deserves a break from the hate….and a hat tip to a job well done.